Many are aware of Adam & Eve story which belongs to the Hebrew tradition. According to the Old Testament, is the first man, created by God on the sixth day of creation. Eve is the first woman not born but created by God to be the wife of Adam. Few scholars say that Adam is associated with the Assyrian ‘Adaman’ meaning ‘make‘ or ‘produce‘ and so ‘Adam‘ means maker or producer. Eve in Hebrew is ‘Havah‘ and is associated with the root ‘hayah‘ or ‘hay‘ meaning life. Adam and Eve lived with child like innocence in the Garden of Eden enjoying, God’s bliss. They were told that they could eat freely the fruit of every tree in the garden except that of the true knowledge of good and evil. 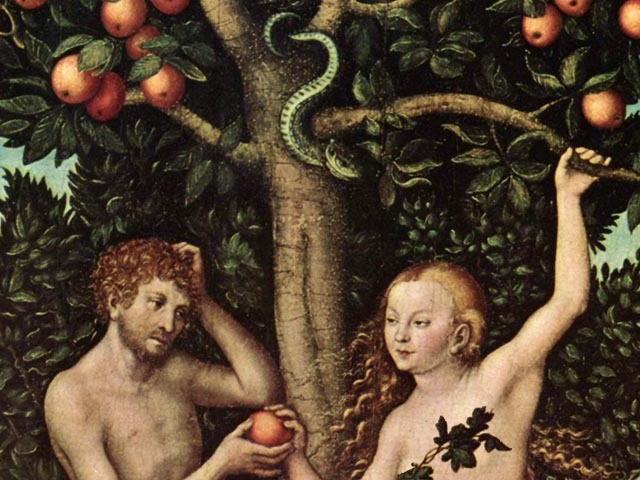 However, tempted by the serpent, Eve ate the fruit of knowledge tree and gave it to Adam. As a result, they became conscious of their nakedness and sin, covered themselves with aprons of fig leaves. In this story, it is said that ‘the God prepared man on the 6th day’ etc., it is evident that the writer of the story did not have the real knowledge of the Genesis of the world. It is not told in the story who prepared the serpent and how the serpent became equal and opposite to the God. Even the ‘GOD‘ who created man and woman was not described clearly how he got the power to create and why did he create ? The original story of Adam & Eve is however described as story of two birds in Mundakopanishad. The initial process of creation from two forces was explained in Prasnopanishad 1/4, written around 6000 BCE. Story of Rayi and Prana in Prasnopanishad : Kabandhi, a student asked the sage named as Pippalada, “From where all these things and animals come into existence?” . Ignorants may think Rayi is female because it sounds feminine and Prana is male because it sounds masculine. But sage pippalada used the word Rayi to depict matter, and Prana to depict energy. This is clear from the very next statement of the sage that the Sun is Prana and the Moon is Rayi, not only the Moon but any form is Rayi.(1/5). Excerpts from Prasnopanishad : Prana acts on Rayi. Various forms are manifested. It is the intermingling of these two that gives rise to the world of diverse forms. The one is active, positive and is the male principle; the other is passive, negative and is the female principle. Prana belongs to the conscious side of creation, while Rayi or matter belongs to the form side of creation. Matter is the universal form. Prana is life or consumer. The body is upheld by the Prana or life principle. Prajapati was desirous of offspring. From this desire a pair sprang forth, viz., matter or the universal form and Prana, life, or consumer. As life and matter, Prajapati is, gradually, the sun and the moon, the year in its two halves, day and night. Prana, Aditya (sun), day, Amurta (formless), life, spirit, northern path, invisibility, belong to the life side. Rayi, the moon, the night, Murta (with form), matter, southern path, visibility, belong to the matter side. Everyone who believes in modern science will agree that sun maintains life on earth. So, sage pippalada disclosed this information thousands of years ago. This is explained with story of two birds in Mundakopanishad 3-1-1 . Two birds, inseparable companions, dwell upon one and the same tree. One of them eats the sweet fruit, the other one looks on without eating. The two birds are Jiva (the individual soul) and Isvara (the Lord). Having known Truth thus, one goes beyond death. There is no other road to salvation. The Jivatman is limited by Avidya or ignorance. Therefore, he is bound by body, mind and work. The Lord is conditioned by Maaya, but Maaya is under His control. Therefore, He is free, omnipotent and omniscient. Tree here means the body. A tree can be cut or destroyed. The body also can be cut or destroyed. So the body is compared to a tree. The reflection of the Parmatman in the mind-mirror is the Jivatman or the individual soul. The Jiva tastes, from ignorance, the fruits of his Karmas, viz. happiness and misery. The Atman is always the silent witness. It is non-doer or non-enjoyer. Enjoyment and agentship are superimposed on the Jiva by the mind. When ignorance is destroyed, when the heart is purified, when knowledge of the Self dawns, the knots of the heart are rent asunder, all Karmas perish, the ideas of doer and enjoyer are annihilated. One becomes identified with the supreme Self and attains liberation. Being seated on the same tree, the Jiva immersed in ignorance, and deluded, grieves, on account of helplessness. But when he sees the other, the Lord who is adored by all, and His glory, then he becomes free from grief. Someone who was not conversant with the high philosophy, just took the stories from these upanishads and rewrote them in his own way. ‘Adim’ means the first, primitive, or original, which may have turned into Adam. Shakti is called as ‘E‘. This ‘E‘ may have converted into Eve. Both the Prasna and Mundaka are the Upanishads of Atharva Veda, which is believed to have been spread in the west by travellers.